Pulliam Gallery is pleased to announce a collaborative exhibition between gallery artist Linda Hutchins and poet Endi Bogue Hartigan on view at Nine Gallery, December 1 - 31, 2011. The exhibition, silver and rust , explores a sense of intricacy and materiality in poetry and drawing. In addition to a First Thursday Reception December 1, 6:00 - 9:00 p.m., there will be an afternoon reception Sunday, December 11, 3:00 - 5:00 p.m. with two poetry-drawing call-and-response performances at 3:30 and 4:30 p.m. The process-based exhibition by Hartigan and Hutchins will change and develop over the course of the month. 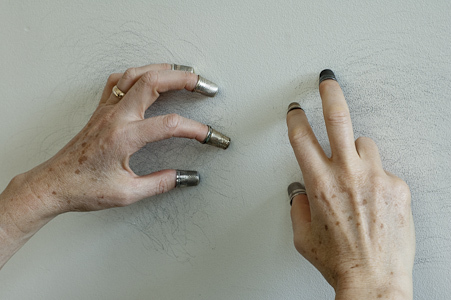 Hutchins plans to draw on the gallery walls with silver thimbles on the fingers of both hands, scratching and stroking the walls to accumulate marks. 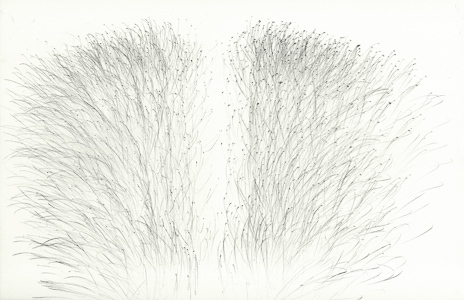 Hutchins and Hartigan will respond to each other's drawing and poetry in conversation and readings, with Hutchins continuing to draw and Hartigan reading and changing out the poem appearing at the entrance to the gallery space. Hartigan and Hutchins became acquainted with each other's work through 13 Hats, a collaborative initiative of a group of writers and visual artists. They are presenting this exhibition at the invitation of Nine Gallery member Kim Ray. Hutchins is also exhibiting this month at the lumber room in a group show, Interior Margins , and at Pulliam Gallery in an exhibition of gallery artists. Endi Bogue Hartigan is a Portland poet whose book, One Sun Storm (2009, Center for Literary Publishing), was selected for the Colorado Prize for Poetry and was a finalist for the Oregon Book Award. Her poems have recently appeared or are forthcoming in a number of journals including: Verse, Chicago Review, VOLT, Free Verse, Pleiades, New Orleans Review, Tinfish, Yew Journal , and others. With a collective of poets, she helps curate the Spare Room poetry reading series. Linda Hutchins has received two fellowships from the Oregon Arts Commission, grants from the Regional Arts & Culture Council, and residencies at Caldera. Hutchins' past exhibitions have garnered national press coverage — including a cover article in American Craft Magazine , a review in Art in America and critical attention on the blog PORT — and she was awarded the Jurors' Prize for her work in the 2009 Tacoma Biennial. Hutchins is represented by Pulliam Gallery in Portland, Oregon. Nine Gallery is an artist-run cooperative gallery located within Blue Sky, the Oregon Center for the Photographic Arts, at 122 NW 8th Avenue, Portland, OR. Nine Gallery is free and open to the public. Hours are noon – 5:00 p.m., Tuesday through Sunday. Holiday hours are noon – 3:00 pm Christmas Eve and New Year's Eve, and the gallery will be closed on Christmas and New Year's Day.